I'm thinking about spring and ordering herbs today. I get herbs from Richters Herb Farm in Goodwood Ontario. They have the biggest selection of all things herbal. We're expanding our herb beds now that we are the proud owners of a hammermill. It's a machine that will chop the herbs for us so we can stop using scissors and giving ourselves carpel tunnel. I'm getting rosemary and lemon verbena and spearmint and some more apothecary roses (because you can never have too many roses). 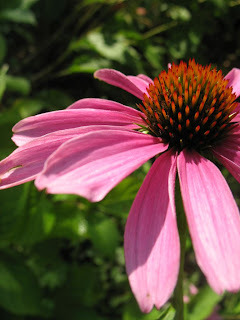 The picture of echinacea was taken by my mom. I scattered lots of echinacea seeds along our driveway in the fall so I'm hoping some of them take. We need lots more of every herb but I'm dividing a bunch of perennials in the spring and that should help a lot. Here's something delicious to do with lavender honey. Actually, you can use any kind of honey for t his recipe but lavender honey is just so perfect. Cut butter into dry ingredients leaving chunks fairly large - size of a grape. beat eggs into milk and vanilla and stir into dry ingredients and butter. 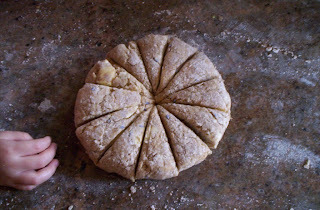 Make a circle and cut into triangles. 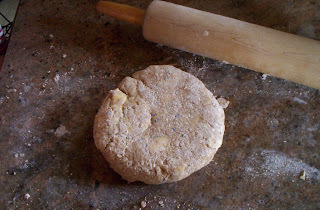 Bake on parchment paper at 350 for 20 min or until golden. 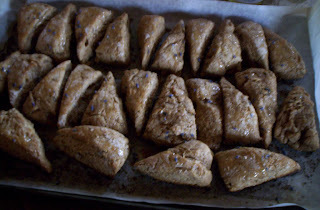 While still hot drizzle lavender honey over scones and sprinkle lavender flowers on top.